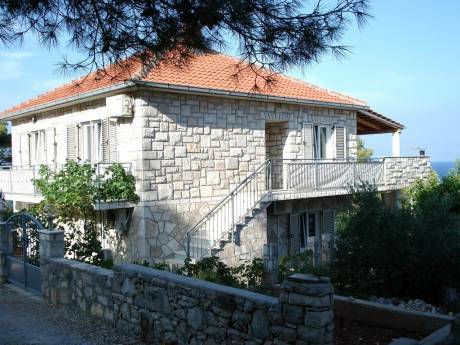 We offer a large and beautiful two story apartment in the beautiful town (village) of Bol (Island Bra&#269;, Croatia). In total 8 people can sleep, but it can easily accommodate a family of 3-5. In the upper floor we have two bedrooms, one with one king size bed and an additional bed and another room with a single bed and a bunk bed and possible 4th bed (all normal size). On the same floor is a full size bathroom with shower, toilet, sink and washing machine. On the ground floor is the entrance hall, one living room with a sofa that coverts into a bed for 2 people. There is a kitchen where whole family can eat and 10 m2 terrace. 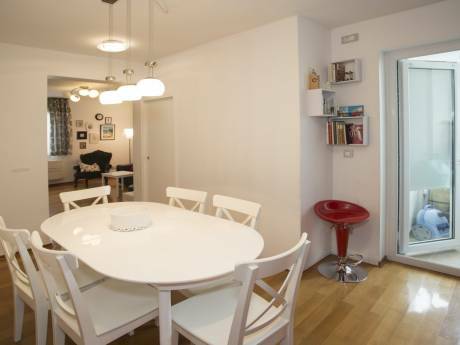 It's a 53 m2 apartment, decorated in young urban style, with wooden floor in bedrooms and ceramic flooring in other premises. Apartment is located in the apartment house (9 apartments),quiet surrounding, very close to the center of the town and only 300m away from the beach. Excellent restaurant that serves typical Croatian food is in the adjacent building. Parking place is assured as well as storage for bicycles and surfing equipment. Gas heated barbecue is at disposal as well. We are Ira and Nenad (in our early forties), married couple with two teenage kids and one toddler. We are both professionals (manager in telecommunication and art professor). We enjoy traveling whenever able to get away. We have not done a home exchange before but are keen to try what sounds like a great way to see another country as a resident - and allow someone else to have the same experience. We are very open minded with business and living experience in foreign countries. Not limited to a particular period. Primarily we would like to find an apartment in a ski resort for exchange, but not limited to that. So, we are open for any suggestions. This is our second home so we are very flexible with dates. Additionally, we have a large house and separate apartment in our home town in city of Zagreb. So it is possible to accommodate guests even when we are there. We are looking forward to meeting people from other countries and cultures. 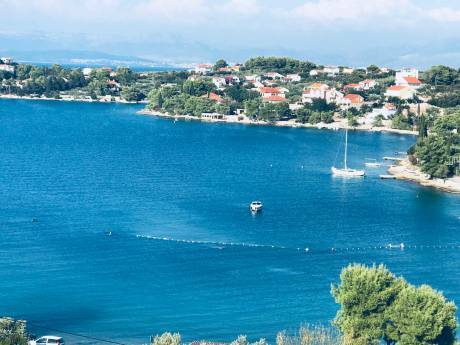 Situated in a picturesque Mediterranean town(village) of Bol, which was couple of times awarded (last in 2010) as an absolute champion of Croatian tourism. It is well known for the famous beach "Zlatni rat" (Golden horn), as well as great windsurfing and diving location, but not limited to that ... You have to experience other beaches, culture, heritage sites, restaurants, clubbing... or just to take a nice walk, hike to 750m peak of the mountain or simply to ride a bike. Bol, the oldest town on the coast of Bra&#269; island, is situated in the southern part of the island. Spacious pebble beaches stretching along 3650 km and numerous springs of drinking water have made Bol the first tourist oasis and popular family holiday destination on the island of Bra&#269;. In abundance of beautiful beaches, Bol is surely most famous for Zlatni rat beach, considered by many the most beautiful beach in the entire Adriatic Sea. The mountain chain of Bolska kruna, Illyrian fortress Ko¨tilo and Vidova gora, the highest peak of the Adriatic islands, rise above Bol. At a distance of only 15 kilometres from the international tourist-sport airport of Bra&#269;, and due to the fast lines with the mainland, as well as the ferry connection from Supetar and Sumartin, Bol is a reachable corner that attracts people with its crystal clear sea, preserved environment and virgin-like beauty of the stone island houses. Numerous archaeological findings and monuments speak of the rich history of Bol dating back to the antique times &#8211; a roman aqueduct, tombstone stelae and reliefs, old Christian sarcophagi, the pre-Romanesque church of St John and Tudor from the 11th century, bishop's residence from the 12th century, the church of the Lady of Mercy from the 15th century, a fortified gothic summer house from the 15th century, a renaissance baroque palace with a valuable gallery of contemporary Croatian art 'Branislav De¨kovi&#263;' from the 17th century and the local church of the Lady of Carmel from the 18th century. The founding of the Dominican community in 1462 and the building of a monastery in 1475, holding collections of prehistoric and antique naval archaeology, a collection of Roman and early Croatian architecture and sculpture, a numismatic collection and a collection of church artifacts preserved until today, are of great importance for the spiritual and cultural life of Bol. The museum also possesses a painting of the Madonna with the Child and Saints, which is the work of Venetian painter Tintoretto from 1563. Besides numerous small restaurants by the sea, discotheques and clubs, Bol also offers relaxing moments with Dalmatian a cappella groups, performances of famous opera singers, theatre plays, but also art exhibitions of famous artists. As the largest tourist centre on the island of Bra&#269;, Bol offers 25 tennis courts and a large tennis stadium with 1820 seats where the world tennis elite gathers every year. Bol is ideal for fans of indoor football, volleyball, basketball, bicycling, extreme sports, which are becoming more and more popular (trekking, free climbing, paragliding, etc. ), water sports, particularly diving and wind-surfing. Due to extremely good winds during the entire summer, Bol is one of the most famous surfer destinations in the Adriatic. Spend family friendly holidays in Bol and experience Bra&#269;, island of culture and adventure. More information about Island of Bra&#269; and Croatia. During summer months, Bol has excellent links with all larger European cities. Brac Airport is located only ten kilometers from Bol. Croatia Airlines, and other European air-carriers offer very favourable seasonal flights to both Bol and Split, since Split Airport is also close to Bol. Croatia and Bol have excellent highway and railway links with Europe. You can look up detailed information on arrival and road conditions on the web pages of the Tourist Board of Croatia and/or Croatian Autoclub. If you are already on Brac, you can look up everyday bus lines Supetar-Bol on the web pages of Autotrans Brac. During summer months, ferries and boats are crossing between Split and Supetar every hour. The ride lasts one hour. You can look up more information on ferry and boat lines and schedules on the web pages of Jadrolinija.